Dried cherries — purchased from Costco, pitted and dried. Luckily put away or they would already be gone. Much cheaper than buying that quantity myself, and no sugar added. I should make muffins. Zucchini sott’olio — delicious but five days worth of work for a small jar. I am all for slow food, but I have limits. Also takes up space in the fridge. 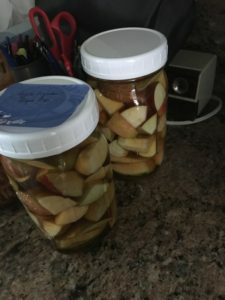 Might be worth doing one jar a year, or several jars all at once, but not more than that. Dried pepper chunks — we still have some from last year. They are delicious, I just keep forgetting we have them. Apple liqueur (?). Still resting, check back in a few months. The liqueurs are tasty but we don’t drink them very fast. Weather: Still in the 90s. What can I say? It’s September in SoCal. 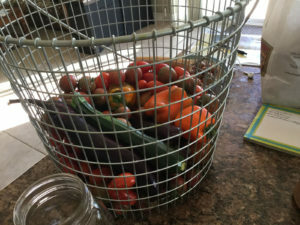 Harvested: Tomatoes, cherry tomatoes, zucchini, eggplant, roasting peppers, French strawberries, raspberries (a few). What we’re eating: ham and green onion quiche, baba ghanoush, lots of leftovers — why? We’re headed out of town. That’s why this post is late too. Expect a second one to follow shortly. Weather: Thankfully a little cooler. Still humid. Someone tell the weatherrman I want a refund. 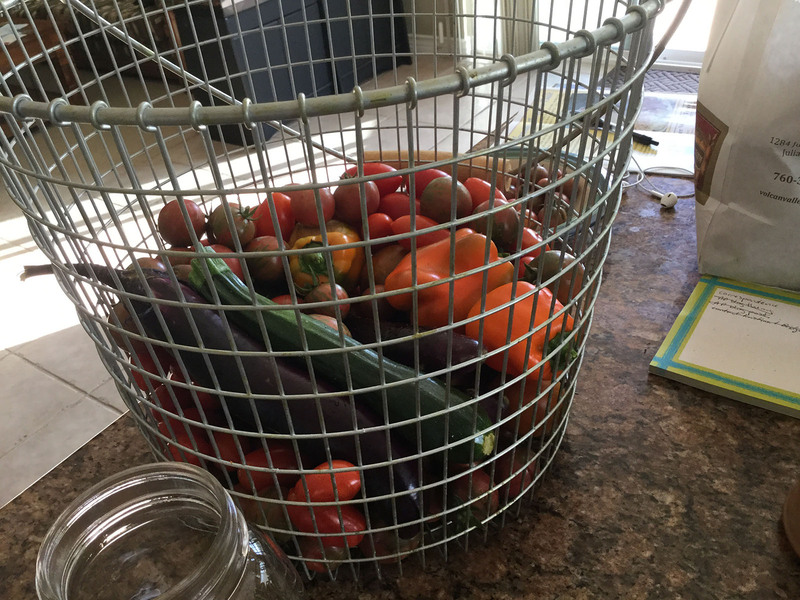 Harvested: Tomatoes (roughly sixteen pounds’ worth), zucchini, bell peppers, basil, eggplants — about ten! Must be headed toward fall. Cooked: Marinated zucchini with garlic, hot peppers, and basil, conserva di pomidori, yogurt. Ate mostly leftovers this week. There will be lots more cooking this upcoming week. Planting: Nothing yet, still too hot, but starting to plan ahead. Beans are still sprouting and seem to be growing well so far. Weather: Scorching! Highs in the 100°F+ zone, lows in the high 60°Fs. No rain in sight. Normal for this time of year, but erk. Fire season. Hoping things stay calm. Cooked: Healthy apple crumble with apples from Volcan Valley Farm — twice!, Nectarine and Beet Salad with Pistachio Dressing (adapted from Eating Well), tomato and eggplant quiche, yogurt, acquacotta (tomato and mushroom soup), sourdough fig and tangelo bread (Sift), avocado toast with eggs, bacon, and shredded cabbage (yum), sourdough sandwich bread, caprese salad, and the husband made smoked shrimp. Mmmmmm. Reading for food inspiration: King Arthur Flour’s fall magazine, Sift. I write in my cookbooks. Shock. Horror. And you should too. No one is going to judge you for that. 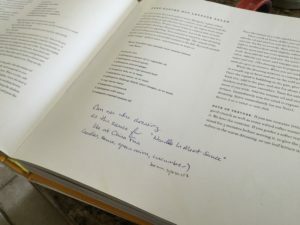 In fact, if for some reason your cookbook ends up being given to someone else, they’ll probably be delighted to see your notes. I know I always am when I find a used cookbook. Why? It saves you from having to remember how you tweaked a recipe last time to accommodate the fact that you didn’t have the right kind of herbs or vegetables, or if you thought it needed more heat, or if the order of the directions was confusing and there was a better way to put it together. Seeing someone else’s notes not only gives you insight into how other people cook (and boy that is useful! ), it gives you some idea ahead of time as to any pitfalls in the recipe or how good the recipe is. I have recipes scribbled on that say ‘delicious!’ and some that say ‘needs work’. ‘Needs work’ is often damning. It usually means I won’t make that recipe again, because it was bland, boring, or needs too much experimentation to fix into something that suits my palate. If the recipe is something I can tweak with confidence, usually it gets a scribble of ‘next time try’ instead. In the age of the internet, it may surprise you to know that I prefer cookbooks and binders for my recipes. Generally I love technology and keeping things updated and sorted. I’m an organized type. I still use the internet to find recipes, but anything I use gets printed out, slid into a page protector, cooked, and then scribbled on if necessary. Why? Sounds like extra work, right? I have pages printed out that are long gone and would have to be found with the WayBack Machine, if it even still has them in cache. (I’m looking at you, What Geeks Eat.) Yes, I could save those to my Pintrest, or use some recipe software. I’ve yet to find recipe software I truly like, and I’ve tried several different ones at this point. If MyFitnessPal integrated a real recipe program instead of just ingredients for nutritional information, and if they let you easily convert your recipes to foods that you could share with others, I’d be all over that. But also, I don’t really like having to touch my electronics while I’m cooking. I’m not too worried about a couple of crumbs or a drip of olive oil on a cookbook or a sheet protector, especially if I’m taking notes as I cook. My iPad, on the other hand, is a little less rugged. So for now, it’s cookbooks and binders. Well scribbled on. Someday I’d like to put together a binder of all the things we really like to eat, so that I’ve got it all in one place, but I do get concerned that we’d limit what we ate more if I did. It hasn’t been happening very quickly. Here in southern California, apple season has just hit full stride. 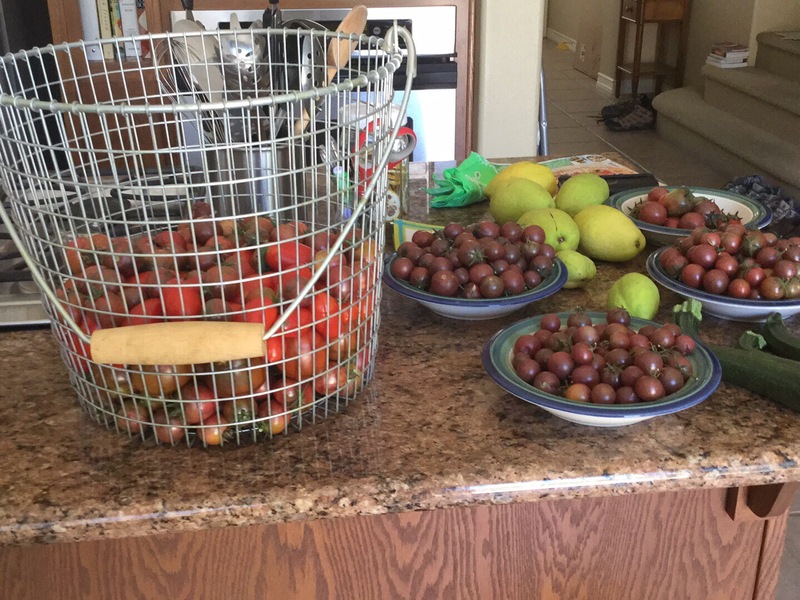 We don’t have any apple trees at our place, so we hauled ourselves off to Julian this past weekend. Ah, Julian. A picturesque town in the mountains, known for Girl Scout camps, Boy Scout camps, church camps — did we mention camping? — and apples. Actually, way back when, Julian did pears (and gold, but that’s another story). It was one of the leading pear growers in the nation, and pears ship more easily than apples. But as technology improved, apple orchards were planted instead. When I was a kid, Julian apples were a big deal. That was where you went for apple picking and amazing pies. As I grew up, though, between drought and lack of interest, the industry dwindled. Luckily, it never died out. 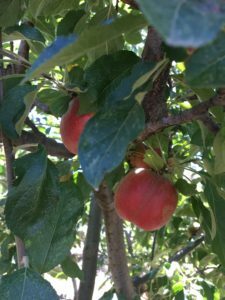 Today, with the revival of interest in hard cider and local food, Julian’s apple growers have a very enthusiastic market for their apples. 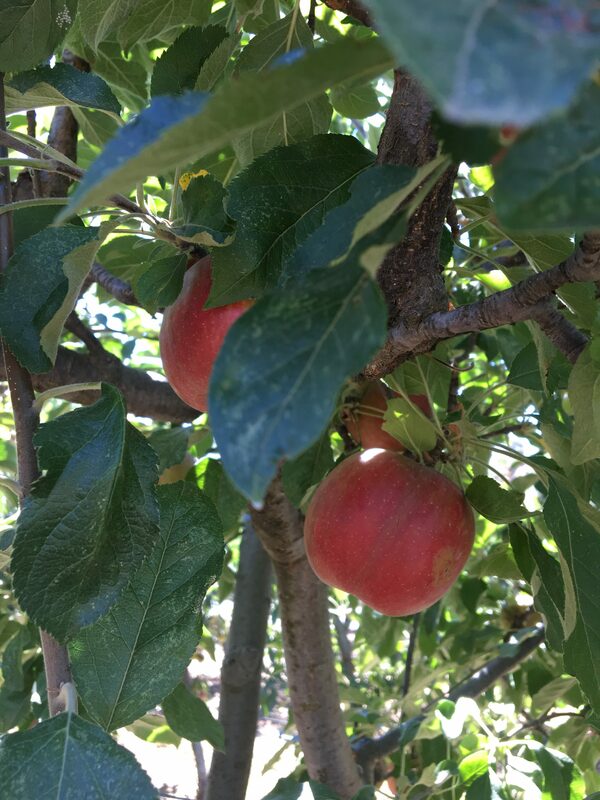 The husband and I went to Volcan Valley Apple Farm for apple picking. 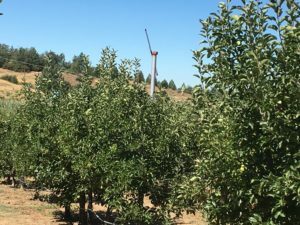 Owned by former San Diego mayor and talk show radio host Roger Hedgecock, Volcan Valley is a handsome orchard, sporting Empire, Gravenstein, Newton Pippin, and my favorite, Jonathan apples. 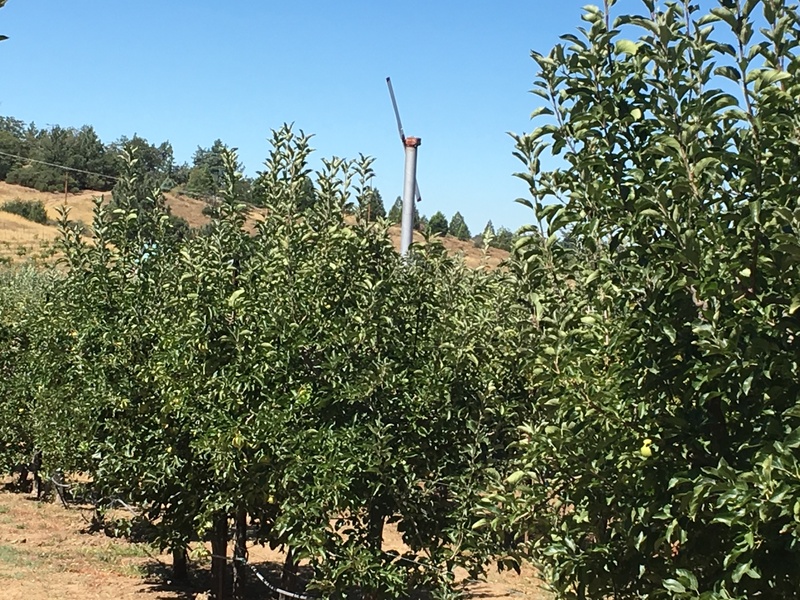 The apple trees are espaliered for easy picking, and you can spot the orchard at a distance from the glitter of the flash tape used to keep the birds off the apples. $24 got us two hefty bags of apples, easily twelve to thirteen pounds’ worth. There were pies for sale, but I had in mind to make my own delicious apple desserts, so we passed on that. Besides, since you’re allowed to taste-test (make sure you eat the whole apple, don’t waste food! ), we were already full by the time we were done. The apples are fantastic. I have missed Jonathans so much. You can’t buy them in the store; they don’t ship well. The few I’ve had storebought (and oh, they have been rare) have been underripe and underwhelming. A proper Jonathan apple as a terrific red-skinned improvement on a Granny Smith — sweet-tart, crisp, complex, great for eating out of hand and also for baking. So what did I do with those? Well, we’ve been eating some of them raw, because who wouldn’t? I also made an apple crumble, borrowing the recipe from Amy’s Healthy Baking. It’s a good base recipe, but since these apples are more-tart and less juicy, I added a tablespoon of vanilla sugar to the filling and swapped the spices for my homemade apple pie spice. I also didn’t need all the cornstarch her recipe called for. It turned out a touch dry, so next time I’ll use less. Aside from that, I’ve got some apple liqueur resting on the counter, and plans for either another crumble or some more apple butter in my near future. I’m looking forward to posting updates about the liqueur when it’s ready! Cooked: crockpot chicken and chorizo with red peppers (The Mediterranean Slow Cooker), ham and green onion quiche (BH&G), roasted eggplant Parmesan (my own recipe, but forgot to take a picture of the end result, d’oh! ), lots of pesto (also my own recipe).